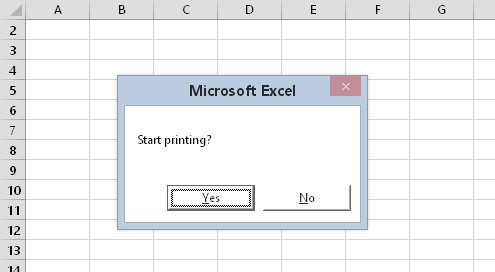 You’re probably familiar with the VBA MsgBox function. The MsgBox function, which accepts the arguments shown below, is handy for displaying information and getting simple user input. It’s able to get user input because it’s a function. A function, as you probably know, returns a value. In the case of the MsgBox function, it uses a dialog box to get the value that it returns. Keep reading to see exactly how it works. To simply show a message to the user: In this case, you don’t care about the result returned by the function. To get a response from the user: In this case, you do care about the result returned by the function. The result depends on the button that the user clicks. If you use the MsgBox function by itself, don’t include parentheses around the arguments. The following example simply displays a message and does not return a result. When the message is displayed, the code stops until the user clicks OK.
Look below to see how this message box looks. 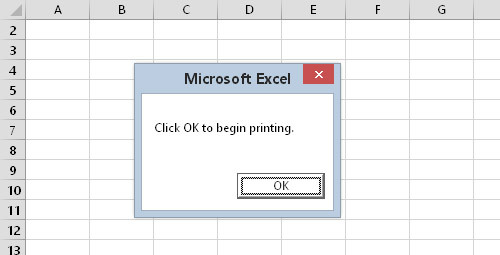 In this case, printing commences when the user clicks OK. Do you notice that there is no way to cancel the printing? Keep reading to find out how to fix that. If you display a message box that has more than just an OK button, you’ll probably want to know which button the user clicks. You’re in luck. The MsgBox function can return a value that represents which button is clicked. You can assign the result of the MsgBox function to a variable. vbOKOnly 0 Displays OK button only. vbOKCancel 1 Displays OK and Cancel buttons. vbAbortRetryIgnore 2 Displays Abort, Retry, and Ignore buttons. vbYesNoCancel 3 Displays Yes, No, and Cancel buttons. vbYesNo 4 Displays Yes and No buttons. vbRetryCancel 5 Displays Retry and Cancel buttons. vbCritical 16 Displays Critical Message icon. vbQuestion 32 Displays Warning Query icon. vbExclamation 48 Displays Warning Message icon. vbInformation 64 Displays Information Message icon. Check out how it looks. When you execute this procedure, the Ans variable is assigned a value of either vbYes or vbNo, depending on which button the user clicks. The Select Case statement uses the Ans value to determine which action the code should perform. A simple message box, with two buttons.